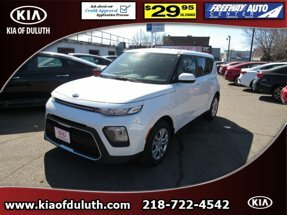 Description If you're looking for a smooth ride, look no further than this 2018 Kia Soul + AUTO with a backup camera, Bluetooth, braking assist, hill start assist, stability control, traction control, anti-lock brakes, dual airbags, side air bag system, and digital display. This one's available at the low price of $26,575. With an unbeatable 5-star crash test rating, this wagon puts safety first. The exterior is a ravishing blue/white roof. Bluetooth allows you to talk on your phone while keeping your eyes on the road. Interested? Call today to take this vehicle for a spin!